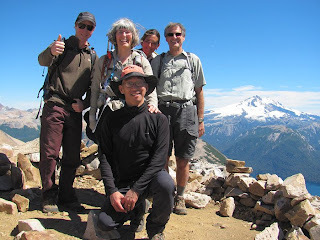 At the top of Pico Turistas, one of the several high points along the Cerro Lopez summit ridge. The big glacier-clad volcano to the right in Monte Tronador ("the thunderer"). It looks like you are having a fantastic time and we are sooo happy for you. Don't worry about us, we're fine and everything is under control here in Libya. M.G. says hi! It looks wonderful up there with the sun on your face and the wind in your hair. Glad you are having a great time!